NDSU › Publications › Food and Nutrition / Why Add Lemon Juice to Tomatoes and Salsa Before Canning? Why Add Lemon Juice to Tomatoes and Salsa Before Canning? You may have heard that adding lemon juice, citric acid or another acid to tomatoes before canning is important, but maybe you are not sure why. It’s all about pH. It is the measurement of the acidity or alkalinity of a solution. Lemon juice is acidic, which means it has a low pH. Soap is very alkaline, or basic, which means it has a high pH. The figure below illustrates pH. Microorganisms such as Clostridium botulinum, the type of bacteria that causes botulism, can survive or grow in some foods at certain pH levels. The Food and Drug Administration and U.S. Department of Agriculture recommend that naturally acidic foods (such as fruit, jams/jellies) and acidified foods (such as pickles and salsa) have safe pH levels before canning. A pH of 4.6 or lower is required for safe canning without the use of pressure processing. Foods such as pickles or salsa need to have an acid added if they are to reach a pH level of 4.6 or lower to prevent microorganism survival and/or growth. Many different varieties of tomatoes are available today. The NDSU Extension Service tested several tomato varieties for pH. 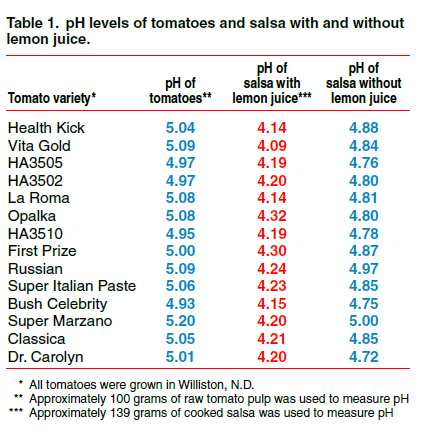 Salsa was made with and without added bottled lemon juice using the different varieties (see Table 1). All tomatoes varieties tested and the salsa products made from them had pH levels above 4.6, so they would require adding an acid to make a safe canned product. What Should I Use: A Water Bath Canner or Pressure Canner? For safety, “low acid” foods such as vegetables, meat and many mixtures of foods require pressure canning using current time/pressure recommendations. Acidic foods such as most fruits and jellies/jams and properly acidified foods such as tomatoes and pickles can be processed in a water bath canner. To ensure safe acidity in whole, crushed or juiced tomatoes, add 2 tablespoons of bottled lemon juice or ½ teaspoon of citric acid per quart of tomatoes. For pints, use 1 tablespoon of bottled lemon juice or ¼ teaspoon of citric acid. Acid can be added directly to the jars before filling with product. Add sugar to offset acid taste, if desired. One to 2 teaspoons of sugar may be enough to enhance the flavor. For more Information, see “Canning and Freezing Tomatoes and Making Salsa” (FN-175), which is available online. The salsa recipe used in the experiment and listed below appears in the NDSU Extension Service publication “From the Garden to the Table: Salsa!” and is available online. Selecting Tomatoes: Select only disease-free, preferably vine-ripened, firm fruit for canning. Caution: Do not can tomatoes from dead or frost-killed vines because the acidity of the fruit may be altered. Procedure: Wash tomatoes. Dip in boiling water for 30 to 60 seconds or until skins split, then dip in cold water. Slip off skins, remove cores and dice. Wash and prepare peppers. Wear rubber gloves while handling chili peppers. Combine all ingredients except cumin, oregano and cilantro in a large pot and bring to a boil, stirring frequently. Reduce heat and boil 10 minutes. Add herbs and spices and simmer for another 20 minutes, stirring occasionally. Wash jars. Prepare lids according to manufacturer’s instructions. Ladle hot salsa into hot pint jars, leaving ½-inch head space. Remove air bubbles by inserting a flat plastic spatula between the food and the jar. Wipe sealing edge of jars with a clean, damp paper towel. Cap with properly pretreated lids. Adjust lids and process in a boiling water canner for 20 minutes. This recipe is best suited for paste tomatoes. Slicing tomatoes require a much longer cooking time to achieve a desirable consistency. You may decrease the amounts of spices, but increasing the amount is not advised. You may make adjustments to suit your tastes after opening the jars.